Ian Taylor (46) brings many years of shipping experience and a considerable amount of ESVAGT knowledge to ESVAGT’s UK office at Dock Gate House in the heart of Aberdeen’s harbour area. 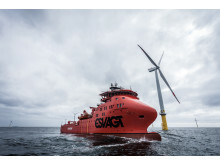 ESVAGT extends its strong UK presence: the ’Esvagt Castor’ will be standby and man overboard rescue vessel on the 1,200 mW offshore wind energy farm project in the UK sector. Claus T. Sørensen will spearhead ESVAGT’s operations in the British market from the office in Aberdeen.